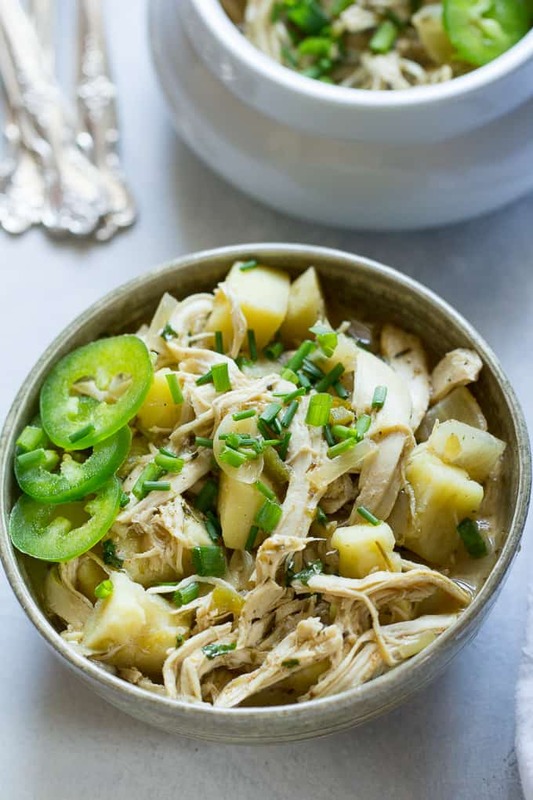 This slow cooker white chicken chili with sweet potato is an easy all in one Paleo and Whole30 meal for any night of the week! Great to makes ahead and pack for lunches too. Do you like sweet potato in your chili? Because I realized that no matter what type of chili I make, sweet potatoes need to be in there somewhere. 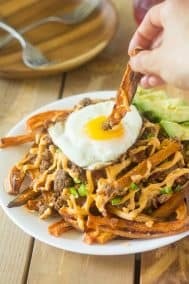 I don’t have many chili recipes on here, but, the ones I do involve sweet potato – loaded chili sweet potato fries, chorizo sweet potato chili, and chili stuffed sweet potatoes. 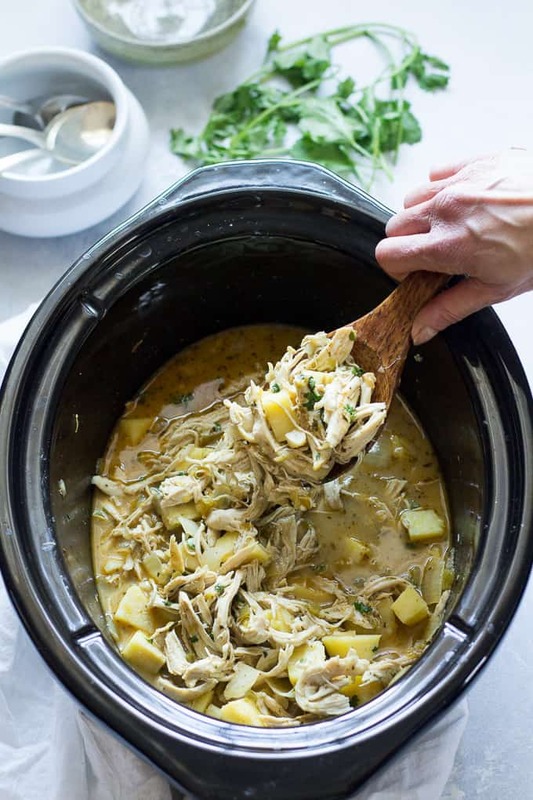 And now – you guessed it – this slow cooker white chicken chili with sweet potato! I’d been wanting to make a slow cooker white chicken chili for sometime, but kept putting it off. I tend to put off most slow cooker recipes – a bad habit for sure. Anyway, one day it dawned on my to throw in some diced white sweet potatoes with the chili, and boom – motivation! Seriously though, if you haven’t tried these I HIGHLY recommend you do – they aren’t always easy to find, but Whole Foods always has them, as well as Asian markets, and, near me at Shoprite. Not to worry if you can’t find them though, you can always sub a traditional orange sweet potato and it will still be delicious. 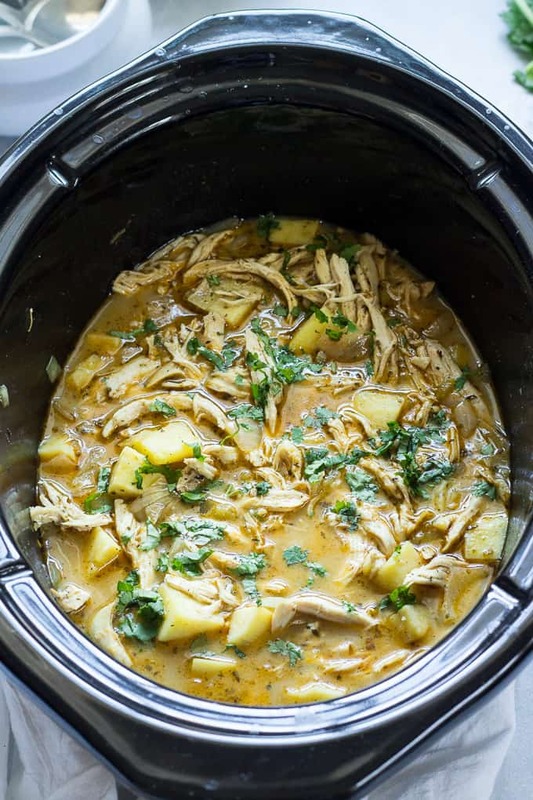 Once the chicken is done and you remove it from the slow cooker to shred, you add a mixture of ghee, coconut cream, lime, and nutritional yeast, then cook on high for 20 more minutes to get the most flavor possible out of this chili! While not SUPER thick and creamy, it adds a nice touch of creamy, almost cheesy flavor to complete the meal. Then you can go wild with your toppings, as wild as you Whole30-ing heart desires. Definitely go for avocado, extra cilantro, maybe sliced jalapeño and even bacon if you really want to go all out. I didn’t specifically include bacon in the recipe, but, you know it’s always welcome ’round here. As with most slow cooker recipes, you can choose to cook this either on long and slow on low (about 6-7 hours) or on high for 3-4 hours. 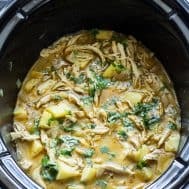 I have a programmable slow cooker which makes the timing issue very convenient – I can cook overnight or during the day and not worry that I won’t be home when the time is up. Okay, I think it’s go-time now! 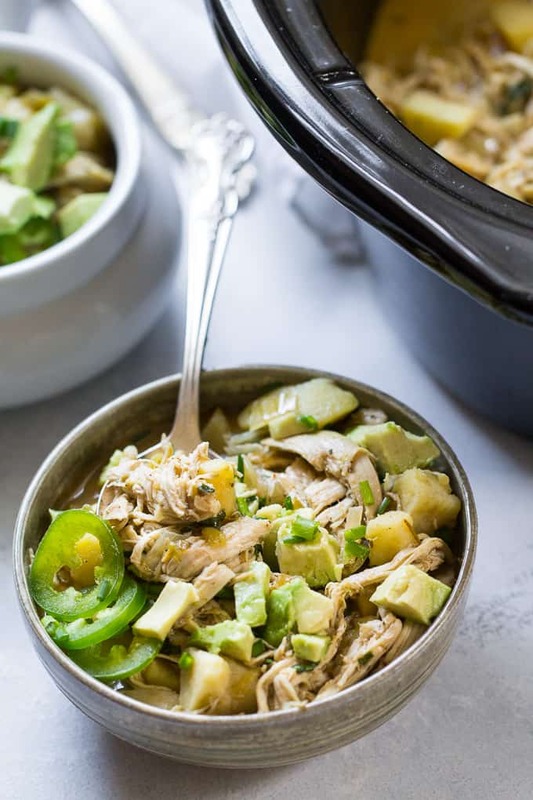 I know I’m completely craving this slow cooker white chicken chili all over again – let me know what you guys think! Place the chicken in the slow cooker and top with sweet potato cubes, broth, green chilis, jalapeño, onion and garlic, salt and all the spices (you will leave out the last 4 ingredients for now) Cook on high for 3-4 hours or low 6-7 hours. I use a programmable slow cooker which makes timing things very convenient! After the cook time is complete, remove the chicken to a large dish and set aside. Add the ghee, coconut cream, lime juice, and nutritional yeast to the slow cooker and stir well to combine. Cover and cook on hi for 20 minutes. 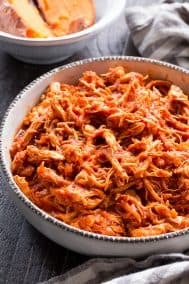 During this time, shred the chicken with two forks, then add it back to the slow cooker after 20 minutes and continue to cook 10 more minutes on high. Serve with avocado, extra cilantro or chives. Enjoy! *If you can't find a white sweet potato, a common orange one will be fine, just cut into 1" inch chunks since they're a bit softer. **Coconut cream is the solid part in a can of refrigerated coconut milk. You can buy full fat coconut milk and use only the thick part, or purchase a can of coconut cream only. 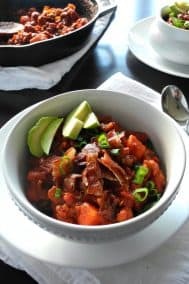 Have you tried sweet potato chili? Are you mild, medium, or hot? This sounds like a great variation on chili – something my husband would probably love! 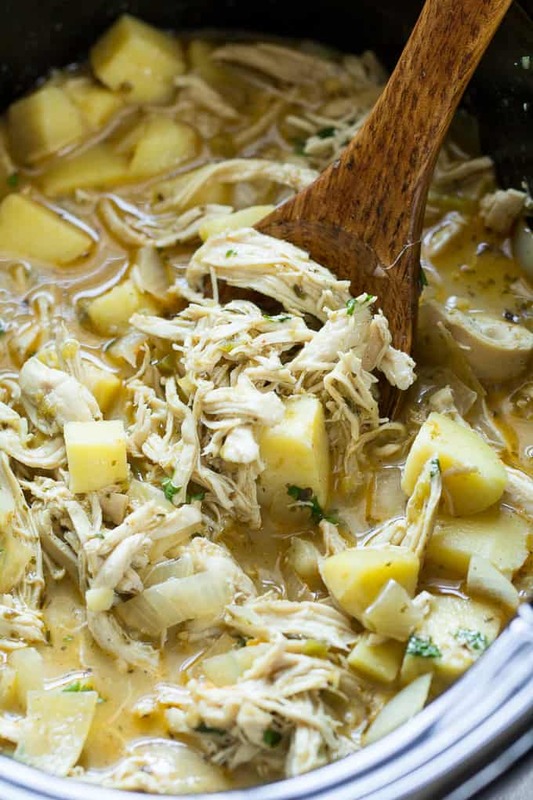 Your slow cooker white chicken chili with sweet potato is YUM! Even the photo is appetizing!! I’m going to cook this for my mom and dad! The weather is chilly at the moment, so I know, this is perfect for our dinner! I really can’t wait to try this when I get home! By the way, can I slow cook without a slow cooker? Do you have a suggestion that you can share with us? Thanks! I am unable to use Ghee due to a dairy allergy with my son. What could I substitute for it? Thank you! Ghee does not have dairy in it…thats why its different from regular butter…it has the milk proteins removed…which is why it is paleo and whole 30 approved 🙂 yay for ghee! I’m so sad! The grocery store forgot to bag my sweet potatoes! I’ve gotta start dinner now. Should I use carrots or peeled red potatoes instead? Help asap! I would’ve left out the potatoes altogether and maybe served them roasted on the side, hope it worked out for you! This was a huge hit with my family! We all loved it! Thanks for the recipe! Wow! This looks so yummy! I would love to try this out real soon. This will be perfect for dinner and I think everyone in the family would love this. Thanks for sharing your recipe with us. Potatoes and chicken are perfect combinations for me. By the way, can I use normal milk for the coconut cream? Can I cook this on the stove? If so any tips? Im cooking this on the stove in my dutch oven right now! Shredded the chicken at the 3 hour mark and went ahead and added the coconut. It’s ready to eat now (3 1/2 hours), but we wont eat dinner for another few hours. Tastes great! Hope that helps! This was so delicious. Thanks for something the whole family (husband, 4 kids ages 2-8, and I) all loved! I made it in my instant pot so I only added 1/2 c broth, and used yukon gold potatoes since that’s what I had on hand. Otherwise made it as written, and it had so much flavor. Will definitely make again. How long did you cook in the IP? Did you just add the cream and such at the end? Gosh, it’s been so long I honestly don’t remember! My best guess is 8, 9, or 10 minutes since chicken breasts are usually 8-10 min and cubed potatoes are usually 7-9. Do you know what you normally do for either of those? That’ll give you a good guide. And yes, just like in the recipe I added the last 4 ingredients after cooking. Good luck! Thanks for letting me know – just updated it! Thank you so much for this delicious recipe! It has been our go to Whole 30 meal. Freezes beautifully and easy to double the recipe. I’ve made with sweet potato and butternut squash. Delicious either way. Ooh that sounds delicious. Glad you liked it! I’m in Australia and can’t find the canned green chillis. Dcan you think of an alternative! Thanks for this yummy recipe, can’t wait to try this! Have you tried Coles: https://shop.coles.com.au/online/mobile/national/old-el-paso-chilli-jalapenos ? Such an easy recipe to put together. It was a big hit with family. Thanks! This was delicious! I added celery (and spinach at the end), drained the liquid into a pot and boiled it with some arrowroot starch and it’s a thicker, creamy, yummy sauce now! So good, can’t wait to eat it all week! That creamy sauce sounds so good! I see the coconut cream used in so much stuff. Do you know if there is anything that can be substituted for it? Almond milk? I’m not sure if it has the fat that is needed. I’m allergic to coconut. This recipe looks so good but I’m at a loss as to what to sub for the cream. You could probably use regular milk. She used coconut cream to keep it whole 30 compliant. I’m also allergic to milk. To keep the creaminess of coconut cream try an unflavored almond coffee creamer. That’s a good idea. Will have to try. Thanks. I was able to serve three people (normal serving sizes, not huge) with about 1/3 serving leftover. Disappointed because I was hoping for plenty of leftovers. Maybe I did something wrong? It was really tasty, and I’ll make it again (I’ll double or triple it next time), I just wish I had known it wasn’t going to serve 6-8 like it said. Hmm, not sure why. As long as it tasted good I don’t think you did anything wrong, next time definitely double it 🙂 Glad you liked it though! I’ve made this for my family so many times now! We’re on our third month of Whole30 and it’s makes the meal plan almost weekly! If I were going to try it in the instant pot tomorrow, how long would you try? I’m trying this for the first time. I won’t be able to cook in crockpot for the full 4 hours so I deboned a hormone free roasted chicken & waited a while to add. I cooked diced regular sweet potatoes in the microwave for 5 minutes to give them a head start. I’m a huge lover of regular sweet potatoes so I’m excited to see how this turns out. Hope to find the white or Japanese sweet potatoes to try next time. Silly question, but do I cut up the chicken breasts first? This was excellent. I threw everything in my Instant Pot and hit meat/stew. The chicken literally fell apart when I took it out. Thanks for sharing! Are you supposed to drain the chiles? I’ve made it once before (and it was amazing!!!) but can’t remember! I used Instant Pot (soup option): shredded pork (season and cooked prior in the Instant Pot) added kale and salsa verde! And….o my stars is this amazing!!!! Finally made this recipe in the instapot. 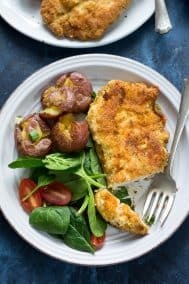 One of our favorite recipes ever!!! How long did you cook in the instant pot, if you don’t mind me asking? 🙂 Hoping to make tonight! Hmmm. Maybe 10-12 minutes. I cut the chicken (we had dark meat) up into big chunks. The potatoes got quite soft, which we like, but you could do the chicken first for 8 minutes, then the potatoes for 4 more. Then I added the last few ingredients per the recipe and hit sauté for a few minutes. It turned out absolutely delicious. A fave for me & hubby. I really want to make this. It sounds amazingly awesome! Can you tell me about the yeast? What’s the purpose and can you get it anywhere? Thx! It’s for flavor (sort of a cheesy flavor) and I buy it on amazon although at least one of my local stores carries it! I finally got around to making this tonight. Absolutely delicious! I’m sure it will become a part of our regular rotation. Thanks for posting! I really love this soup! I made it in my insta pot too. Chicken and all ingredients except the last 4 for 10 min and then removed the chicken and added the rest of the ingredients for 5 min. Potatoes were a little softer than when i had it at a friends house but still delish! My soup was pretty thick as i used a thick organic bone broth i bought from Costco. I ended up adding some thin chicken stock to the leftovers so it’s still a soup and not a stew. Here’s my question: Can this soup be frozen or will that make the potatoes gross? Whole30 chili has never really been appealing to me. Without the beans, it loses its hardy, filling charm. The addition of the white sweet potato (always found at Whole Foods) was a godsend, and I don’t even miss the beans anymore. This has become one of my household favorites, even when I am not on Whole30. I’ve made successfully in both a slow cooker and Instant Pot. I always end up adding some tapioca starch at the end to thicken it up. I like to top it with green Tabasco sauce for an extra kick. Can this soup be cooked on the stovetop if I don’t have access to a slow cooker? 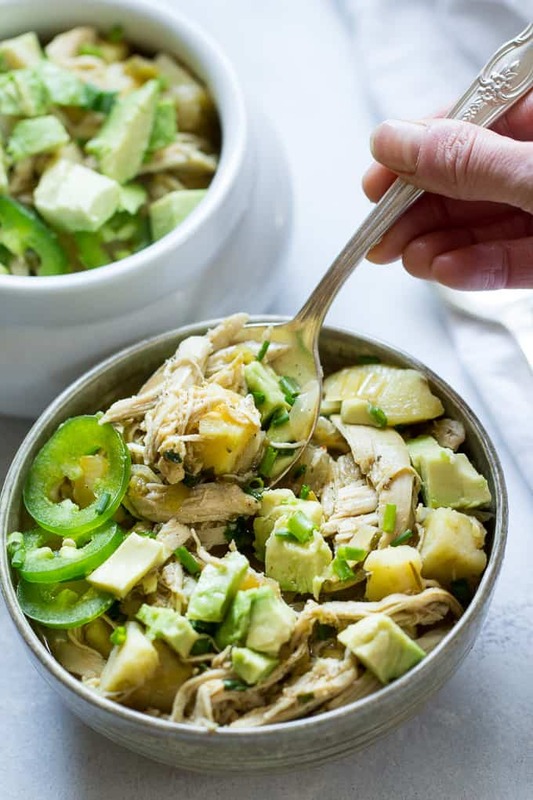 Michelle, are you able to provide the grams of fat/carbs/protein per serving or cup of this recipe….really want to try and make it this weekend. Thanks! How important is it to leave the coconut cream and lime out until the end? I’m wanting to prep this all for a freezer meal and then defrost and put it in the crock pot all at once. The coconut cream will break if cooked too long unfortunately! I just made this and it is AMAZING. In my 30 years of existence, I’ve never felt compelled to write a review for a recipe until now. I have already shared it with anyone who will listen. It was easy to make and delicious topped with some avocado. This is a crowd pleaser! I omitted ghee and nutritional yeast. This recipe is on repeat now. I’ll double next time because everyone returned for seconds and some for thirds. 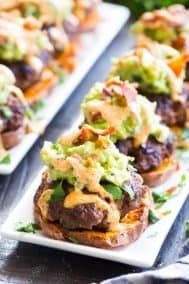 We enjoyed topped with avocado and extra cilantro. Oriental sweet potatos really add a nice sweetness and texture to this chili. Simply perfect meal! I think I cut my potatoes too small because they turned to mush. I used a purple sweet potato so it was a purple mess BUT it tasted AMAZINGGGG! Next time I’ll be cutting them larger and maybe adding them a bit later to make sure they stay solid. Such a good recipe! Fantastic! Everyone loved it and asked for your recipe. They didn’t believe it was Whole30! Making again. Hi! 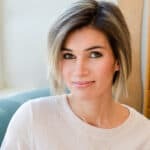 I just came across this delicious-looking recipe and am excited to try it! I currently live in Japan, so the Japanese white sweet potatoes are always available to me. 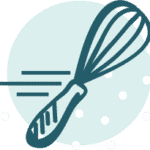 Do you have other recipes you use them in? Thank you! You are the first person to share my OBSESSIOn with japanese sweet potatoes! Its the reason I wake up, too! Every sunday I buy a bunch from WF, cut them in half, coat with olive oil and roast at 400 for 40 minutes face down. Then I eat one half every morning with some sauerkraut and a hard boiled egg. Perfectly well rounded breakfast and it truly has changed my life. 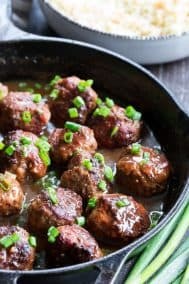 How can you make this in the Instant pot and have you ever used the slow cooker method on the IP? 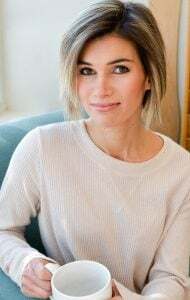 Love your recipes…every one!!! Love it! So darn good, defiantly adding as a regular meal in our house hold. Made this tonight and everyone loved it! Delicious! This recipe is definitely better the next day after it’s had time to marinate, etc. I didn’t find it thick enough, so I added a cassava flour mixture to it to thicken it up. I didn’t have much more vegetables on hand (due to our extreme winter weather, I couldn’t go get any! ), so I just added half a bell pepper in addition to the sweet potatoes. I wish I’d added more, though, to bulk it up. I also wish it had some different spice recommendations, just to change it up a bit. I like cumin, but I also kind of don’t. Does that make sense? 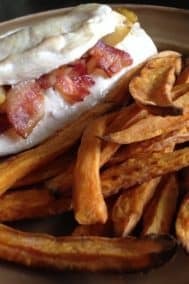 I’ve done this recipe several times and love it! 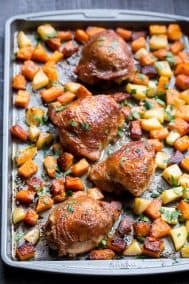 I’m wondering if I may be able to use chicken thighs instead of breasts? Love love love this! I top it with cilantro, avocado, green onions, and CHIPOTLE SAUCE. One time I put chipotles in adobo in the crock pot (no longer “white” and that’s ok because YUM.). Great recipe that has been a staple for me this winter!